A kitchen renovation can be a lot of fun. Proper planning will ensure that the renovation will indeed be fun and also help to avoid problems later on. Of course, the professional who will be performing the renovation have knowledge and experience for you to call upon (and you should use that knowledge and experience), but the decisions will mostly be up to you. Sketch – The handiest tool when designing your kitchen is a drawing. Sketch out what your new kitchen should like. Your sketch will probably change a few times as you move down this list, but the drawing will give you a sense of how the finished kitchen will look. Measure – A common problem in kitchen remodeling is buying appliances and cabinets that simply don’t fit. Include accurate measurements in your sketch to know the sizes you need. Triangle – We have discussed the kitchen triangle in previous posts, but it basically means plan your work area. The triangle’s three points are the oven, the refrigerator, and the sink. This will be your main work area and a well laid out triangle will make kitchen tasks much easier. Usage – You will certainly be cooking in your kitchen, but what else will you use it for? Will you need seating at the counter? Do you want a breakfast nook or snack area slightly removed from the work area? Will you be entertaining in your kitchen? Consider these questions carefully. Storage – You need to decide how much storage area you need. Your kitchen cabinets will hold most of your kitchen items, but a pantry can be created for even more storage area. Ask your renovators about your options. Appliances – This is a very enjoyable part of renovation for most people (we all love to spend money). When shopping for appliances keep in mind what you need (not necessarily what you want) and how the new appliances will fit into your kitchen. Remember the measurements on your sketch! Style – This area is completely dependent on your own tastes. We recommend you choose styles that you have like for years and not whatever is “hot” recently. As we mentioned earlier, designing your new kitchen should be fun. There is certainly some work involved, but our easy guidelines will help you stay on the fun side of your kitchen project. 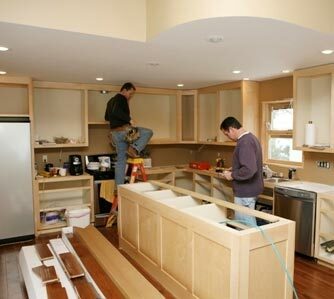 Outer Banks Custom Kitchens is your place for kitchen renovations in Hatteras . Call us to discuss your plans and desires for your Outer Banks kitchen remodeling. With 50 years of experience on the beach, from Ocracoke to Corolla, Outer Banks Custom Kitchens can give you the kitchen of your dreams. To get an idea of what you might want your new kitchen to look like, check out the beautiful kitchen at the top Outer Banks Wedding Venue. We can help you make all of your kitchen dreams come true.